A new mascot was unleashed in Athens, Ga., on Saturday, which is a big deal, I guess. The old one kicked, so this guy gets the official collar and everything. *None of John McCain’s limbs were harmed — or even thought about in a lighthearted manner — in the making of this post. My apartment isn’t this nice. But you have to love a bulldog. Ugly was never cuter. I thought I heard somewhere that one family has bred the actual Georgia Bulldogs for a really long time. Does anyone have that article or story? I thought I read it on here actually. P.S. Note to Bryan… I love your posts! Keep up the great work. I love your sense of humor and your take on uni’s. Don’t change anything. Palin B-Ball pic in color. Where did the linky button go? I guess it’s automatic. Great. Cute dog. If bulldogs didn’t slobber all over the damn place I would get one. Thankfully I didn’t snap a picture last night, but Nick Swisher was going with the top two buttons of his jersey undone, revealing the White Sox logo on the undershirt. It was ridiculous. Some good pics of Oklahoma’s opener against UT Chatanooga…Crimson vs. Mustard. at last nights bakersfield blaze/modesto nuts game, both teams wore black jerseys in honor of a high school student who died a couple of weeks ago at football practice. he also played baseball. his school retired his baseball jersey after the game. classy move by the teams, but it did get confusing at times. 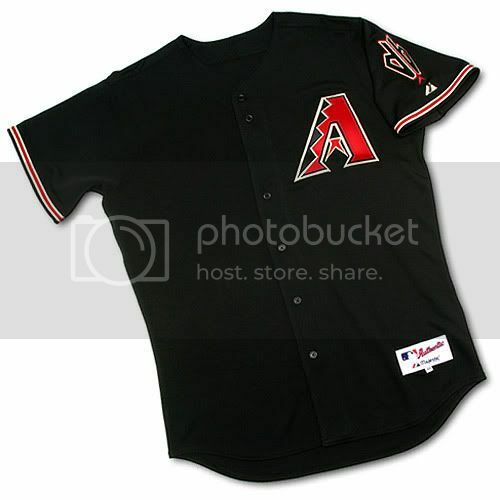 Did anybody else notice that last night, the d-backs black jerseys’ had d-backs on them instead of the A??? I saw it on sportscenter… Little picture on the d-backs home site…. Apparently it was “Los Dbacks” night….which is the dumbest thing ever. *No offense to references made to John McCain were taken during the making of this post. [quote comment=”286953″]I thought I heard somewhere that one family has bred the actual Georgia Bulldogs for a really long time. Does anyone have that article or story? I thought I read it on here actually. Yep. Sonny Seiler and family have provovided the Uga mascot since the 1950s. It even got a mention in Midnight in the Garden of Good and Evil. oh my god, you are right. I know Paul has done a feature on the whole “los” thing before, but this just took it to a hole nother level. I think next year, on like cinco di mayo or some other hijacked Hispanic holiday/celebration, Paul should have a special article titled “Los Uni Watch”. now THAT’S irony! That’s why I have a pug! Incase you ever wondered what Cal Ripken would look like as a Ray, here you go. Chung was Doxey’s mentor at the DB position and was wearing #29 in his honor. A different player is going to wear the #29 jersey in each of the Ducks home games this season. Pretty cool. High School game on the Mothership right now — Rockford MO looking great in all-white, school name on front & numbers in blue, small eagle logo on the arms. That’s it — no stripes on the pants, plain white helmets. New leader in the clubhouse for best fb unis of the season. If someone could get a screen grab, that would be appreciated. It’s Rockhurst, but yeah. Definitely better than Blue Springs South’s blue/green monstrosities. Rockhurst is a private catholic school in KC, and are always one of the top rated fb teams in the country. Being from KC, I was kinda shocked to see a KC high school fb game televised nationally. Is there a story behind that? Last week they had Carmel, IN vs. Indianapolis Cathedral — guess it’s a cheap way to fill programming without having to pay even more heads. I love how MLB pays tribute to the Hispanic heritage that has made up a great deal of what baseball is today. However, teams need to quit being lazy and just simply put a “Los” in front of their name. I know that most people that speak spanish say the team name the same way it is in english, but teams need to really show that they are honoring the heritage. My suggestions: Either go the Milwaukee and San Fransisco route and have the full spanish name, or keep the english name and do hispanic heritage colors. I will be attending the Brewers/Padres game on September 6th, and that day has been noted on brewers.com as Cerveceros day in Milwaukee. I totally agree that all clubs should go this route and stop being lazy by just adding a “Los” to their uni’s. *As a side note, is this the first time both teams will have a Spanish name on their uni’s? Nice Stooges reference in the title today. It is a Stooges reference? Yeah? My better half is a Giants fan, so my brother scored big points with her when he sent her a Gigantes hoodie for Christmas. It’s gotta be, right Marty? [quote comment=”286961″]Some good pics of Oklahoma’s opener against UT Chatanooga…Crimson vs. Mustard. It looks like a WNBA logo. I’m guessing the colors are blue and orange? I was thinking more along the lines of the Uncle Tupelo version, but the Stooges work for me. Revilie, the unofficial mascot of Texas A&M, is probably the most powerful dog in all of college sports. All of the Cadets address her as Miss Rev, Ma’am, and if she barks during a class, then the class is dismissed for the day. The Rockhurst-Blue Springs south game is on because one QB is headed to Illinois and the other is headed to Missouri. One of them supposedly is a high on ESPN’s top 150 list. Here’s a, uh, swoosh for you. OU’s got the ketchup (or, if you prefer, catsup), UTC’s got the mustard, UGA brought the dogs. It’s a Labor Day BBQ on Uni Watch! Colorado will be running its new Raffie tonight too. Regarding the “Los D-Backs” uniforms. * This comes specifically from northern Mexico. It could be different in different geographic areas. They should be called “Los D-Bags”, instead. I think you are the first person to say that. What you said was very funny. It was very original, as well. Keep these fresh jokes coming! Are Louisville’s uni numbers the same font as the 49ers? Nice Uncle Tupelo shout out! Reveille is the most powerful dog in all of the NCAA- she’s actually a Brigadier General! Seriously, she has rank on every other member of the Corps of Cadets at A&M. That just one of the many reasons Aggies are the laughingstock of the Big XII. Those bumps on Colorado uniforms are so weird… and they have them, or something that looks like them on them on their pants, too. either way, their uniforms look like total crap (this coming from a Denver native). At least they haven’t decided to tweak the helmet, but I’m sure that’s only a matter of time. At least CSU has managed to keep a pretty good look, although I don’t know why the thin stripes down the leg are necessary. After CC’s one hitter*, things got a little ugly… but again, the Brewers won, so I don’t care if they look sloppy. Un-tuck the jersey for a job well done. Go Brewers! *MLB calls it a one hitter, but I call it a no hitter, but I am very biased as you may know. Ricko, Oregon wore Green/Green tonight. and listening to the broadcast they said that a different player will wear #29 every game. Fed’s USO shoe—don’t see anything special here—no USO trophy logos as usual. If anyone wants to buy me this 1966 Tiger Stadium usher’s jacket and pants get-up, I wouldn’t be opposed. While I agree with you… I’ve kind of thought about it a bit and I think it all depends on how the teams are called in Spanish rather than what the translation is. For example, the Dbacks are the Dbacks in Spanish (very few people refer to them as Los Diamantes… Spanish media in Phoenix and elsewhere). Growing up in Venezuela and watching the MLB in Spanish certain teams were always what they are in English while some were translated. Anyway… I’ve missed a few but from what I’ve seen, the teams that have done these Hispanic promotions have been fairly accurate. And Oakland and Washington? Atleticos and Nacionals? This may have been mentioned, but here are the new Arkansas Razorback uniforms, complete with pants. I’m not a fan of the red on red. Anyone see the ESPN Sunday conversation with Roger Goodell? Both logos made an apperance. Notice the backdrops on the 2 camera angles. How does this happen??? [quote comment=”287040″]Anyone see the ESPN Sunday conversation with Roger Goodell? Both logos made an apperance. Notice the backdrops on the 2 camera angles. How does this happen?? ?